Each portion of the cosmic trinity contributes about one-third to our success in life, creating 100% overall good fortune. Heaven Luck (33%) is said to be predetermined; this is our karma. 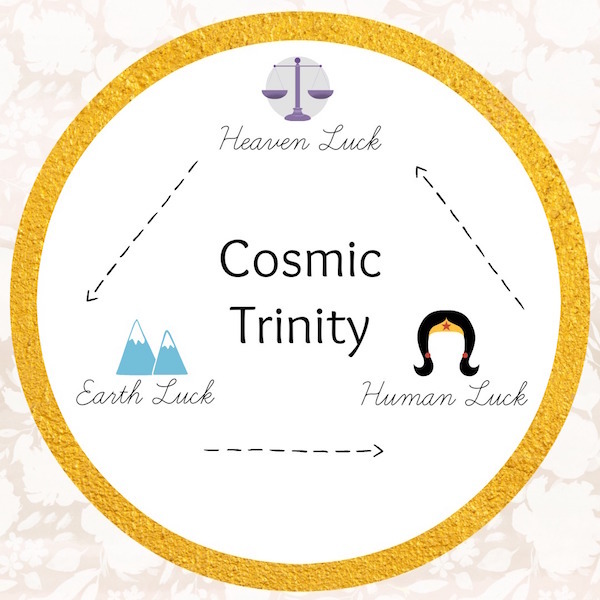 Our heaven luck represents our individualized fate, celestial mandate, astrology, current soul contract we were given at birth. We came here for a reason, and this is how we live our life. Earth Luck (33%) is adaptable and is represented by the Feng Shui, energetic flow or stagnation, around our home environment, plot of land, neighborhood, natural surroundings, and elemental balance. This can be optimized by practicing the tools of Feng Shui to create optimum chi flow throughout your home. Through Feng Shui, you will be able to enhance your health, relationships, success, reputation, intuition, family bonds and even wealth. Human Luck (33%) is the most malleable. Our free will creates this through our actions, choices, our ability to work through our conscious and subconscious beliefs, our intentions and our spirituality. It can be said that the cosmic trinity describes the relationship between heaven, earth, and man. All three affect our destiny and we can learn to optimize our environment and actions to better influence our fate. This is believed to be predetermined, BUT I believe that there are tools out there to at least heighten this luck by clearing your ancestral line and your karma from your past. Past Life Regression: You can use this tool to find out your past lives and see what you have experienced previously. This may help you to decipher certain limiting beliefs, fears or unresolved traumas that have now returned in your current life. If you do not know of a past life regression practitioner, you can always find books or meditations from Denise Linn (or Brian Weiss) who I have used before for my past life regressions. Cord cutting: You can also use a cord cutting meditation with the Archangel Michael to set you free of any past or present life soul contracts such as poverty, a vow of celibacy, or even a vow of silence. He can be invoked to cut your karmic cord to the past. Family Karma Clearing: Healing your ancestral lines is another way to strengthen your heaven luck. Limiting beliefs and traumas can be passed down generation to generation, so its a very good idea to delve deeply into the past and remove anything that was passed down that does not align with you and your purpose any longer. You can find a meditation or course for this or just pray to the angels to help heal your ancestral karma. We have many Soulful Practitioners, including myself, here at Our Sight Your Light who can help you with these things. This again is the easiest luck to change and quickly. Now you probably don’t want to move right this second, but you can Feng Shui your home indoor and outdoor to start changing your luck around. Everything is made up of energy, so the more positive energy you have surrounding you, the better shape you will be in to heal and manifest your desires. Decluttering: Clutter, unused items, frustratingly cramped areas of your home, and closets filled with clothing you don’t use are all detrimental to positive chi flow. Release yourself of anything from the past to easily make room for new opportunities and growth in all areas. Feng Shui: Feng shui is the meticulous diagnosis and analysis of a home’s energetic flow. The better the flow, the better the luck. It can also be used to enhance abundance, success, health, finances, and so much more. Improve your overall space to create a home environment that actually supports your dreams for the future. Learn more about my Feng Shui Consultations HERE and let's work on supporting your Earth Luck. Oh human luck. This can actually be quite hard to fix if you aren’t properly guided or aren’t ready to make substantial life changes. This isn’t law of attraction stuff; this is the deep-rooted subconscious beliefs, fears, and traumas that are keeping you stagnated in certain areas of your life. This isn’t "change your thoughts, change your reality," it is a complete soul analysis, an unlearning and then relearning the truth of your inner child, your lower self, your higher self and your ego. This is why I have created my Soul Expansion sessions. After years of trying to change my life using law of attraction, visualization, and meditation techniques to no avail, I came across the psychology of shadow work and have been studying and practicing it ever since. The concept is, you delve deeply into what is in your subconscious so you can learn more about what needs to heal, needs to be let go of, and needs to be matured into a proper belief that suits you. This is not easy work as our highest version of ourselves are often hidden beneath our childhood pains and beliefs. These unfortunately show up in the frustratingly stagnated areas of our lives that can block us from success, love, and abundance of all sorts. With the lovely help of vibrational medicine, Flower Essences can allow us to realize these hurts more easily, help us to heal, and guide us in our connection to our higher self that ideally should be running the show full time. Learn more about my Soul Expansion through Flower Essences HERE and let's raise the vibration of your Human Luck. AUTHOR: Bianca Mastrototaro is an OSYL Home Energy Healer, Feng Shui Consultant, Flower Essence Practitioner, and Chinese Herbalist, offering a variety of powerful services to help you turn around the energy and flow in your home, body, and soul. Trained in ancient Chinese, Tibetan, Native American and modern healing modalities to help YOU get to where you want to be. Older PostWhat's my Moon Sign... and what does it say about me?